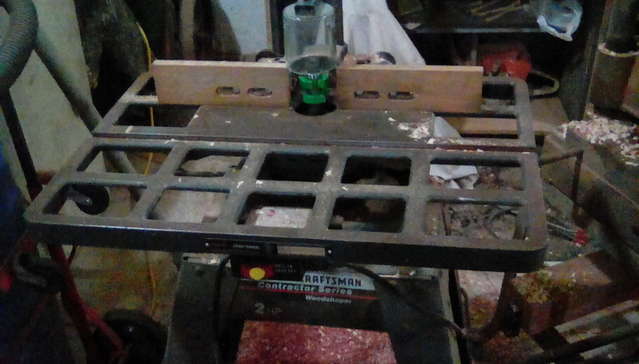 I found a craftsman 2 HP shaper at an auction for under $25. I want to tongue and groove or glue joint 2 inch material. My plan is 2 rabet bits 1\2" and 2 spacers 1\2". I plan to alternate spacer rabet spacer rabet. That setup will run me about $50. Then after a while invest in more sets for other things. You think it will work? I have the same dilemma. I bought an old Delta/Rockwell shaper and plan to use it for 2" stock T&G. There just are no sets for T&G that big and I'm thinking I need to to the same thing. I found a few things from my shopsmith that will work on this shaper. The jointer head makes me think I could get molder knives for it. I fired it up today and it works great.I think it was good score. Now i need to get those other cutters ordered. Look into "Euro block" cutter heads. I have three of them I like them so much. The head itself will be a little over $100, but the knives are only $13 or $14 a set with $1 shipping from routerbitworld. You can't beat that as far as cost per profile. And they actually do have a 2" tongue and groove set. The 40mm knives are the standard, but most heads take 50mm knives as well (almost 2"). Being a smaller shaper, you'll probably want the small aluminum head. Around 88mm I think. 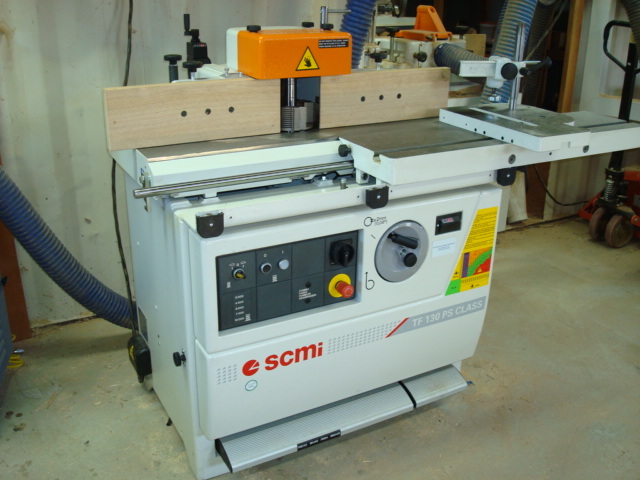 Amana profile pro, and cmt universal shaper cutterhead. I think others sell them as well. Just stay away from the woodline set. I sent mine back, as it was poorly machined garbage. Well you could "read the book"... if you never have you could find and read the Shaper Handbook. 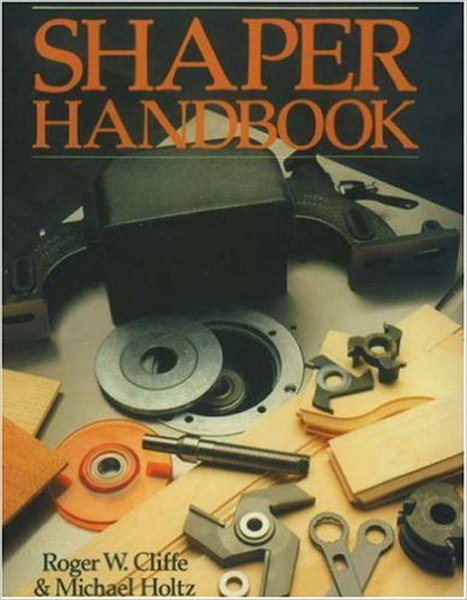 I read it and I learned a lot about how to use a shaper from it. Wow, I really like the design of the Euro block cutters. The only problem is the size - they have a 30mm spindle hole! My lowly Rockwell is only 1/2". Right now has a 1/2 hp but was planning on putting 1hp on it. I will check out the euroblock. I also have the 1/2" shaft. This brings another question. Grizzly has, I think they called them T block spacers. They looked like adapters for cutters with larger shaft sizes. Is that what they are for? Jim, I think that book is what I need. That is what they are for but...... Be advised, that is a small light shaper, and just because you can find bushings to make a cutter fit does not mean it should run on that machine. Shaper accidents are ugly. The book suggested could be aquired from the local library, but read it either way if you don't have an old hand to show you the ropes. The only thing I can actually think of using it for is the big tongue and groove and possibly finger joints. Rob, I may take you up and borrow that book. I will check the library first so you are not without it. I am very surprised the cutters are not keyed or locked on other than compression from the nut. If I get time I will get a picof it tomorrow. It is in the shop in the middle of the floor awaiting a spot. It has a cove cutter on it. A slight tightening of the drive pulley and it runs smooth. $27 well spent for this machine. They have 3/4" cutterhead, 1" heads, and 1.25" heads. I have two 1.25" heads and one small 3/4" head. T-bushings are what the adapters are called. I use them all the time to bush 1.25" cutters on my 1" spindle shapers. Bushing up a 1/2" spindle to use 3/4" cutters is pretty common. Most companies throw in a set of 1/2" bushings with 3/4" cutters. The 1/2" spindle would probably be too small for a Euro block though. 1/2" shaper cutters are usually pretty inexpensive though. Yes, but what I was hoping, maybe unrealistically, is to be able to do a 2" T&G (in one pass) on my little shaper. I suppose I could cut the "tongue" in 2 passes, the groove in one. That would be a lot of material to remove in one pass. It also depends on how deep you want the tongue and groove I suppose. I was thinking about those Euro blocks - with that guard profile, they would only remove about 1/8" per pass? So it would take multiple passes no matter what you were cutting, no matter how much power you had. That is not what those do. They will only allow so much to be cut PER REVOLUTION. 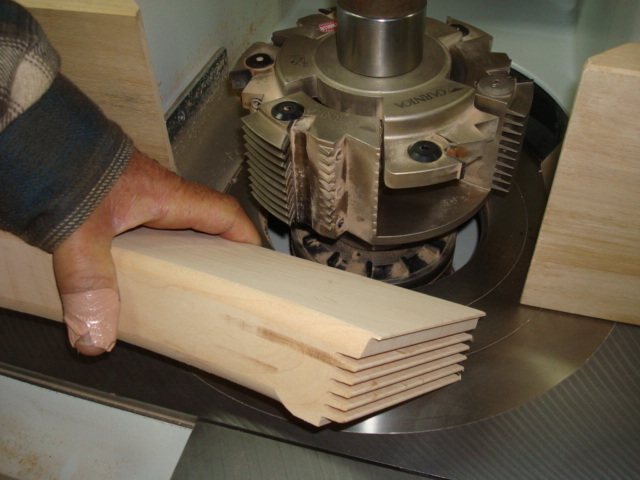 You can still take take a full pass if you machine will allow, but what it does is does is stops the wood from diving into the cutter in the case of a catch. On the old style cutters without limiters really bad things could happen, like a piece getting sucked right in in a catch situation so fast you could not get your hands out of the way fast enough. European cutters are rated for hand or power feed for this reason. Not sure if a Euro block will work either, but if it will you will want to keep your feed rate down to keep stress to a minimum. Slightly faster than when it starts to burn. If you buy one get aluminum, and if offered in different diameters get the smallest diameter. You only have a half inch spindle so you want to keep the forces down as much as possible. Think leverage. The farther away from a spindle a cutter is the more force on the spindle. Roughly twice the cutter size puts four time the force on the spindle. Machines like Hackleberry's Oliver have a lot of mass and heavy spindles. Not sure what his weighs, but my Unitronix weighs over 3000 pounds. And there is a label on mine that warns about using too much cutter without a spindle support. It says, "Use of spindle extension without spindle support can result in Death!" Seriously, thats what it says. Make sure you have enough space under the nut for the size cutter you order. That would be the unthreaded part of the spindle. when you bolt on a cutterhead, make sure it is all the way to the bottom of the spindle, no spacers under the cutter. You will see stacks of cutters on commercial machines, but you can not do that with a light duty machine. What is the diameter of the cutters? You'll probably be fine with a slow feedrate. 2" diameter. From grizzly. Does a larger diameter effect the power of the machine? It would make sense if it does. I really never considered the diameter. It affects the power to some degree but more importantly, it increases the stress dramatically on the spindle. 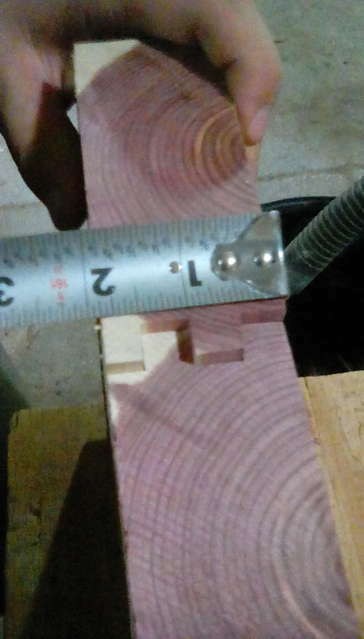 We need to be careful with our lowly 1/2" spindles. We can't compete with the big boys! There is a professional woodworking store just off the sq in Springfield. I can't remember the name of the place but they have all kinds of shaper bits there. Good quality. They are the Powermatic dealer also. Mighty Mite Band Mill, Case Backhoe, 763 Bobcat, Ford 3400 w/FEL , 1962 Ford 4000, Int dump truck, Clark forklift, lots of trailers. Stihl 046 Magnum, 029 Stihl. complete machine shop to keep everything going. That would be Ballew Saw and Tool. They do carry the full Amana line along with Freeborn, and LRH $$$$. Thanks Jim and Larry. It would be good to check them out. I like to find new places to go look around. Ozarkgem, off the subject bit I forgot to show you the shingle attachment while you were here. If you are back this way come by and I will get it out for you to look at. That will be good. Things were a little busy that day. I want to stop a Trumans also. I will give you a call. I have been buying from Ballew for must be 25 years, good company. Holbrens is another one I have good service from, have an order in right now. Amana cutters are an awesome deal. I have been buying their insert cutters, and they are all perfect at a very reasonable price. Don't let spindle size be your only consideration when trying to decide how big of cutter you can spin safely. You also need to consider how rigid your spindle is. I have two shapers that take interchangeable spindles. They both have a 3/4" and a 1" spindle I can swap between. But I wouldn't consider spinning an 8" cutter on either one, even with the 1" spindle installed. 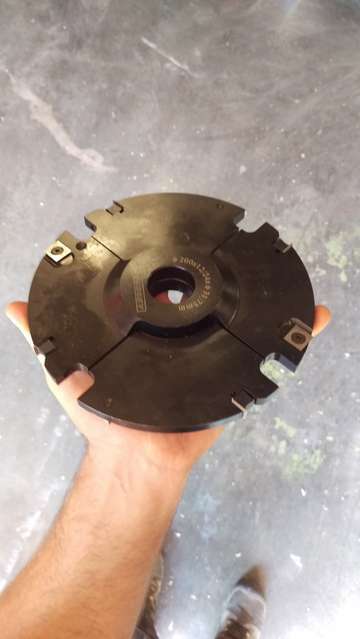 I have a powermatic that has a solid 1" spindle that I might spin larger cutters on from time to time, but even the powermatic isnt very heavy built. The Oliver is the only shaper I would consistently spin cutters like this on. And if someone wanted to stack multiple cutters like this, they would likely need a shaper that's more robust than my Oliver. I believe Larry has one that would handle it. These guys will spin cutterheads in excess of 12 inches in diameter. I assume the slowest speed on those shapers is around 3500 or so. Rpm is another consideration when picking cutterhead size. The larger diameter, the slower the rpm. Most shapers are between 7,000 and 10,000 rpm. Good info. I guess I thought I could slap on anything that would fit and running it. It is good to have such knowledge at hand. Thanks! I have been thinking I need one with the programmable hood to help with my eyes getting old, but by the time you get it optioned out with everything I want I may as well look at Martins, and then they cost too much. If I get a job that will pay for one though, I'll have one. The Uni. I have is as big as I would ever need, will swing a 14" cutter with a spindle support, but I would like to have tilt as I have become known for not being afraid of round work and tilt would help. I also want a tenoning table as I do quite a few doors, but ya, they just cost too much for now. I think if I walked through Tule Peak's shop there would be every tool I could want and probably a few I didn't know existed. I would love to take a tour of his shop, it looks like Disneyland for woodworkers. Got the cutters and put them on. It works smooth. Didn't bog at all. I did this in one pass for each side. Total cost. $27 for the shaper and $66 for the cutters spacers and a bearing that I didnt end up using for this. Grand total $93. Never thought about it, I guess you can have more than one tongue/groove set. I'd definitely call that a win. That shaper book is still looking for an address to send it to ! The philosophy I subscribe to..
We missed out on a big bandsaw and big rigid lathe that only brought $60 each. I was running out of spare cash. I am also needing to rearrange the shop. I am thinking of the best placement of each piece and future tools. 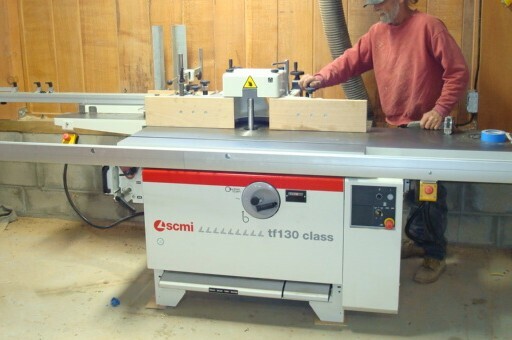 A longer beded jointer and a good table saw. The saw I want is co ing up in an auction soon. What you need now is some mobil bases. You bet! a base that moves when I want but doesn't move when I don't. I think I could buy out the caster section of most stores and not have enough. things like old tire machines and other heave stuff that I don't use often that could be nicely rolled out of the way. Use (or make) an engine hoist. Pick up what you want to move, roll it to its storage space and plop it down. Only one set of casters and you don't need to figure out a what to keep your tool from trying to move away from you when you use it.